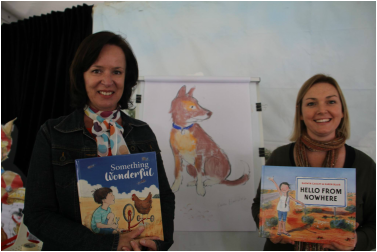 Having won the Speech Pathology Australian Book of the Year Something Wonderful was short listed for the 2017 Patricia Wrightson Prize for Children's Literature and now the most awesome news of all! Dolly Parton's Imagination Library has selected it for their 2019 list. It's also going to be released in Korea. Meosjin Mueos-inga! The story of Sam, the 6 year old physicist who wonders if a raindrop really is round and likes to feel the bend in tree branches, this one is all about nurturing creative thinkers. It's about getting out there and discovering physics for yourself too, and about the value of nature play. Once again, Karen Blair has done the illustrations and oh boy, what a great job she's done. Her nephew, Alexander, was the model for Sam, (he's just like Sam,) and he and his dad actually built Sam's machine.